January 19, 2017 – Belle, MO – Brewer Science is investing in the innovators of tomorrow by promoting opportunities for learning more about science, technology, engineering, and math (STEM) in the elementary schools located in Vienna and Belle, MO. Teaming up with several local teachers, Brewer Science’s intern program recently hosted a Steak Dinner and Auction fundraiser for education. Local businesses donated items, which were auctioned off at the steak dinner hosted by the Fraternal Order of Eagles in Vienna, and sponsored by Mr. Tom Eads. Auction items were donated by Silver Dollar City, Branson Belle, Kansas City Royals, Six Flags, Kent’s Jewelry, Walmart, Red Door Gifts, St. James Winery, Hibbett’s Sports, Hallmark Store, Grellner Distribution, Taylor’s Jewelry, Panera Bread Co., Matt’s Steakhouse, Slice of Pie, and Sinks Pharmacy. Baked goods were donated by Janet Kline, Laura Payne, Tonya Price, Tracy Edwards, and Julie Littrell. Loretta Wallis donated artwork. Steve Vogt donated autographed baseballs and sports cards. Each school received a check for $4,000 to enhance STEM education as well as two new iPad® tablets per school, which were donated by Brewer Science. 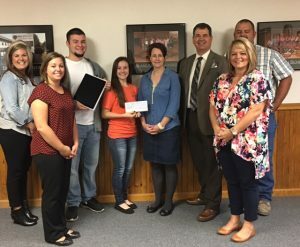 Proceeds from the event provided funding for mobile STEM learning labs at the Belle and Vienna elementary schools, and Brewer Science matched a portion of the funds raised at this event. The sponsorship is part of the company’s commitment to enhancing STEM education in Missouri schools. In addition to this event, Brewer Science leads interactive science activities at local schools to encourage students to explore learning.